Just north of Santa Barbara is the exclusive Hope Ranch neighborhood, which features some of the area’s most spectacular houses, set back along tree-shaded and beautifully landscaped streets. This is a nice spot to run in some shade and gaze at some lovely homes. 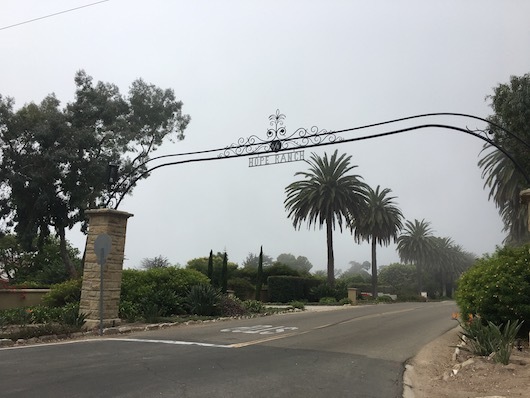 The main road running through the neighborhood is Las Palmas Dr., which works its way from Highway 101 down to the coast, running into Marine Dr. and Cliff Dr. and Arroyo Burro Beach. There’s a good shoulder and little traffic. Signs say that these are the roads that are “open to the public”, but we won’t tell if you sneak into some of the smaller side roads. Hilly -- depends on which direction you run in! Neighborhood entrances off Rt. 101, or off Marine Dr./Cliff Dr.